Angela Merkel’s open door for war refugees will push government spending up by 31 bln euros over two years. Healthy public finances mean Berlin can foot the bill. In the face of sluggish global growth, the stimulus will make Germany’s relative strength more pronounced. 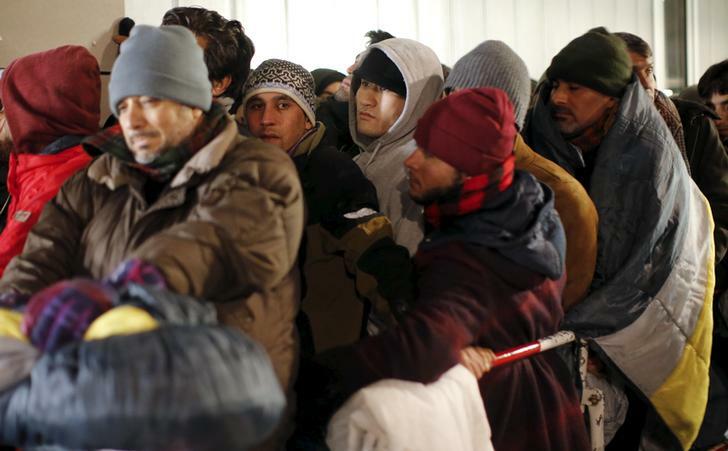 Migrants queue on a street to enter the compound outside the Berlin Office of Health and Social Affairs (LAGESO) for their registration process in Berlin, Germany, December 9, 2015. Hosting more than 1 million war refugees will push up German public spending by 0.5 percent of GDP in 2016 and 0.75 percent in 2017, the Bundesbank said in its monthly report for December. As the government neither intends to cut other expenditures nor increase taxes, the additional outlays are similar to an economic stimulus programme. Adjusted for a different number of working days, the German economy will expand by 1.7 percent in 2016 and 1.9 percent in 2017, according to Bundesbank estimates. Employment, which in October reached a new record of 43.4 million, is expected to grow by another 0.9 percent next year, while wages per worker will grow by 2.7 percent. Germany reports GDP for 2015 on Jan. 14. Economists polled by Thomson Reuters expected the country to report annual growth of 1.7 percent.